At most museums, “Do Not Touch” is a core commandment. Even at idiosyncratic institutions like the New York Hall of Science or the City Museum in St. Louis, licking or sniffing the exhibits is not encouraged. 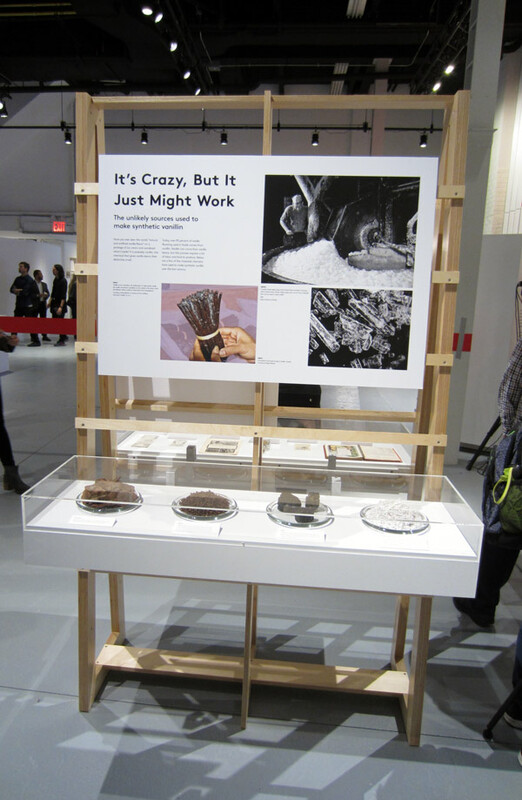 The behavioral guidelines are very different at Brooklyn’s just-opened Museum of Food and Drink (MOFAD) Lab. 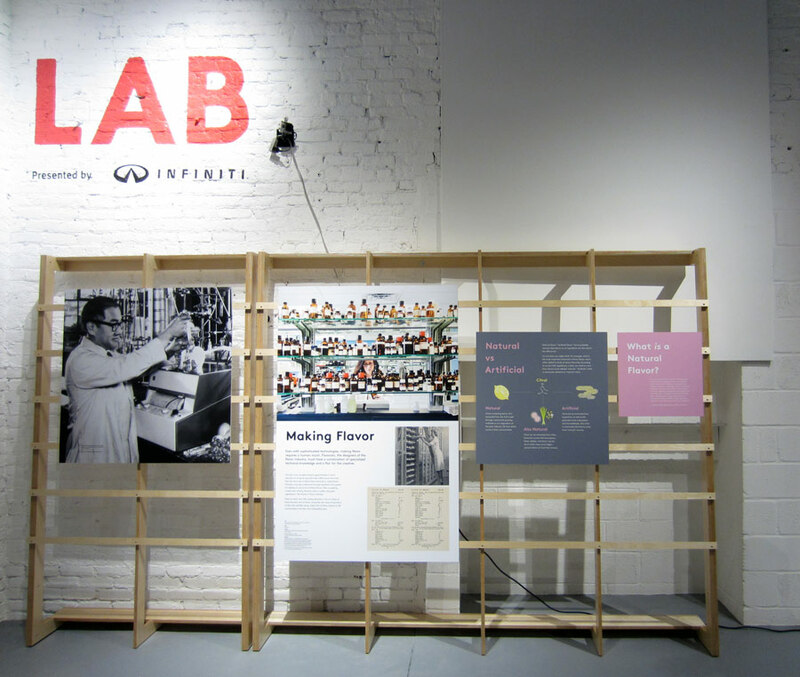 MOFAD Lab engages all five senses to investigate the history, science, and culture of food and drink. Housed in a converted mechanic’s garage across the street from McCarren Park, MOFAD Lab is the first brick-and-mortar museum devoted exclusively to what the world drinks and eats. The first exhibit, Flavor: Making it and Faking It, explores flavor production and manufacturing. MOFAD founder Dave Arnold explained the need for a physical museum in the digital age: “watching TV shows, you’re not able to taste food. The MOFAD Lab is a place to experiment” with how to best engage and present MOFAD’s novel items and ideas. It is also the testing ground for a possible, but as yet unconfirmed, permanent museum space. 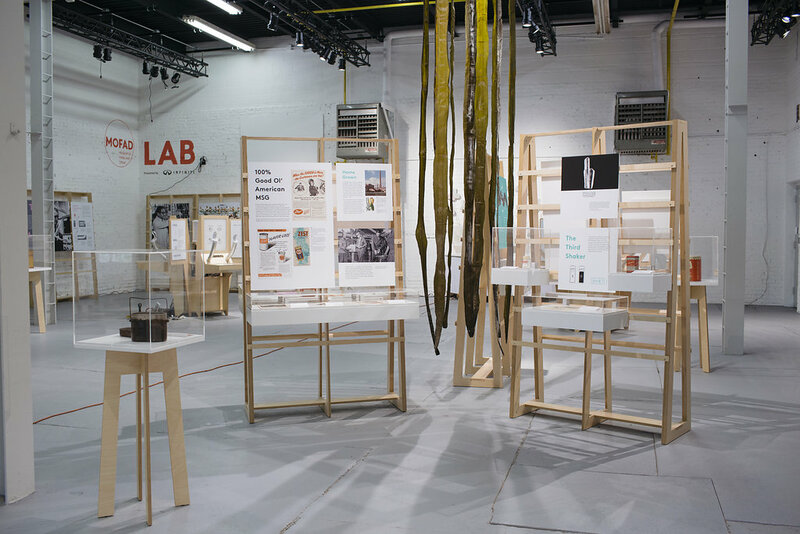 Wyeth Hansen and Ryan Dunn, the designers behind Brooklyn-based Labour, directed MOFAD Lab’s entire creative strategy. The duo has worked with Arnold and executive director Peter Kim since 2012 to develop the logo and branding strategy. When it was certain the museum would assume a tangible form, Labour extended their work for the lab into 3D, designing the installations, creating graphics and video, and commissioning fabricators to create specialty aroma-producing machines. Dunn describes the aesthetic of MOFAD Lab as “Eames’ office meets Willy Wonka.” The team worked fast to convert the raw space into a museum: there was a three month turn around time between the design phase and the October opening. While declining to name a figure, the duo stated their budget was “not big.” The space, consequently, has a polished DIY feel: Hansen and Dunn described the exhibition as a “hierarchy of modules,” underscoring the flexibility of the program. Wall text and some displays are mounted on a system of wooden cleats. The cleats allow for quick install and breakdown, while ensuring that every text panel is aligned with its neighbor. Labour enlisted design and engineering firm RUSHdesign, located right down the street from MOFAD, to fabricate the frames and smell machines. Voll, exhibition designers based out of Bedford-Stuyvesant, created a floor-to-almost-ceiling paneled wall, and the housing for a video installation that greets incoming visitors. The proximity of the fabricators enabled an especially fast turnaround between design and build. 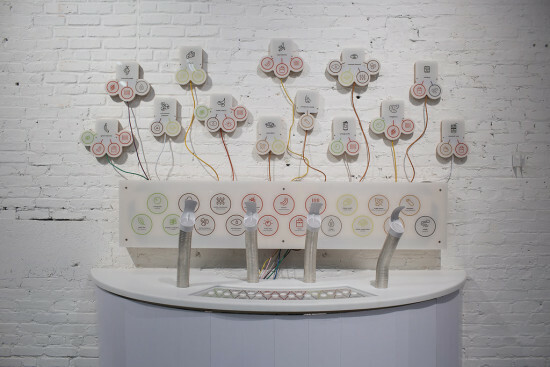 The mother of all the smell machines is the whimsical Smell Synth, a taxonomy of scents, edible and not. 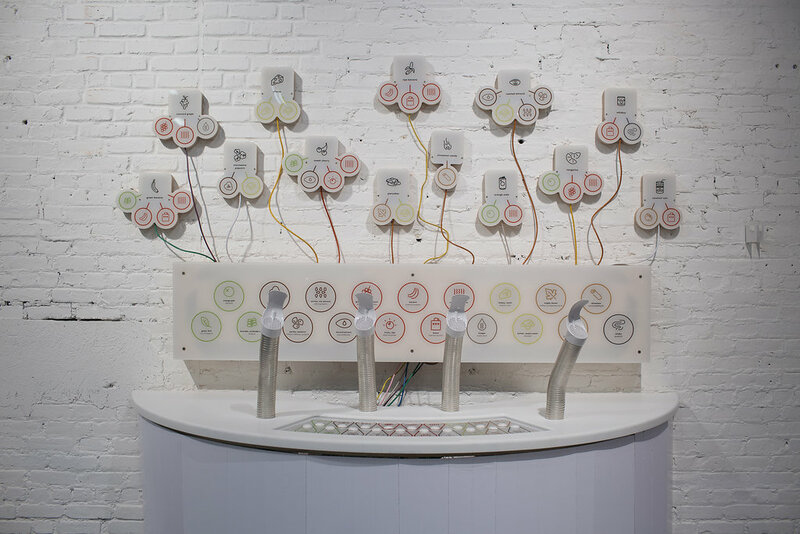 Visitors may breed hybrid smells from 19 choices like “Pancakes”, “Fruity” and “Cheesey/Vomit”, or “Vanilla” and “Nail Polish Remover.” The machine lights up when its buttons are pressed, while its tubes emit puffs of the chosen olifacton. 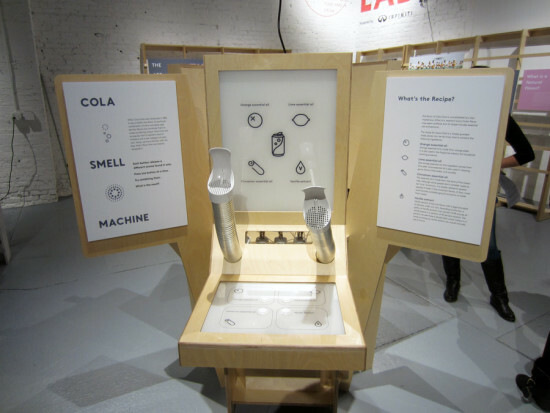 Amazingly, the Smell Synth took seven to ten days between design and installation. Beginning October 28, MOFAD Lab is open to foodies (and the general public), though as of yet, no hours are posted on their website.